Upload Your Weather Directly to the Web! 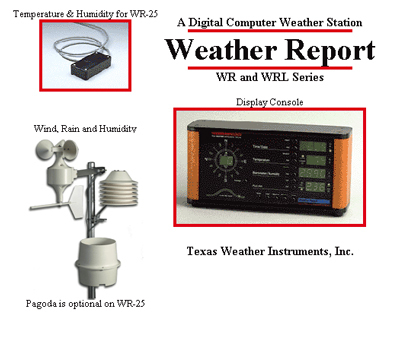 The Network Weather Station™ (NWS)™ is an internet- based wireless weather station that allows the user to put local weather information directly to the Web. No computers are necessary! 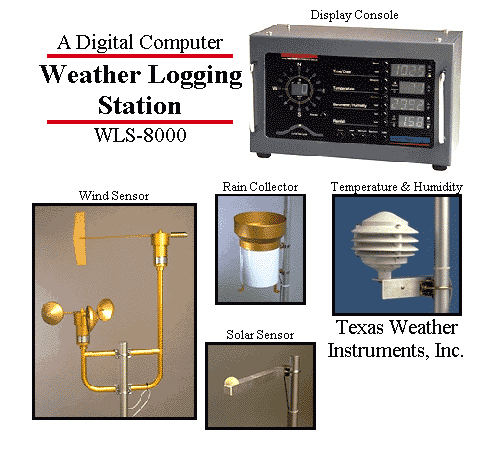 Weather data is gathered by the outdoor sensors and fed into the Texas Weather Instruments Outdoor Controller. 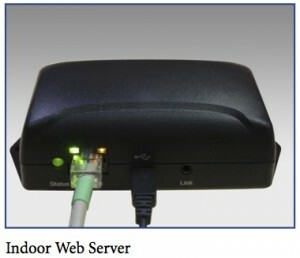 The Outdoor Controller transmits the data via a wireless signal to the Indoor Web-Server plugged into the internet. The data can be viewed on the Indoor Web-sever by any computer, tablet or smart phone attached to the local network. The data can be displayed,logged, and graphed locally on Weatherview 32 a windows program or remotely on the internet via Wunderground.com. 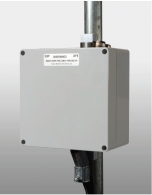 Outdoor controller – 2.4 GHz maximum power ISM band radio, integrated mast mounted enclosure. Inputs include wind, temperature, humidity, pressure, rain, solar radiation and lightning. Other inputs include system voltage, on board temperature, two optional temperature sensors inputs, two voltage inputs, two switch closure inputs. Specs: 6 to 24VDC tested range 500 feet to 3 miles, depending on the environment. Dimensions: 13” x 9” x 10”. Indoor Web-server – 2.4 GHz maximum power ISM band radio, Ethernet jack, Micro USB power jack, status LED. Functions include, receiving data from outdoor controller, display data via internal web-sever, access unit setting via internal web-server, HTTP post data to wunderground.com , FTP data out via ASCII space delimited text or XML data format, HTTP post data out via ASCII space delimited text or XML data format and Telnet for troubleshooting. Data is also available locally in the web-server. Dimensions: 5” x 2” x 1.5”. Wind – Model TW-WS – Speed – Accuracy 5%, Resolution 0.1 mph (0.1 m/s) Range 0-199 mph, sample interval 1/sec. Direction – Accuracy 5%, Resolution 22.5°, sample interval 1/sec. In NWS-Solar Model TW-WSA Speed Accuracy 5%, Resolution 0.1 Range 0-199 mph, sample interval 1/sec. Direction 360° Accuracy 2°, Resolution 1°, dead band 12°. Weather impacts all facets of your life and monitoring it is important not only for compliance, but also for safety. 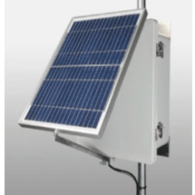 The RWS-Solar is not only the first weather instrument that can upload data directly to the web, but it is the only instrument that is easy and cost effective to use in remote locations. If you want to retrieve weather from a remote location – the RWS is your solution. How do we make this happen? The unit receives power from a solar panel mounted on the station. The RWS communicates with the TWI Data Center via the Verizon and/or Sprint cellular network. The TWI Data Center then forwards data to Wunderground.com, and/or Txwx.com. The TWI Data Center will host your data so no infrastructure is needed from you. The windows program Weather View 32 Home is included with the weather station. 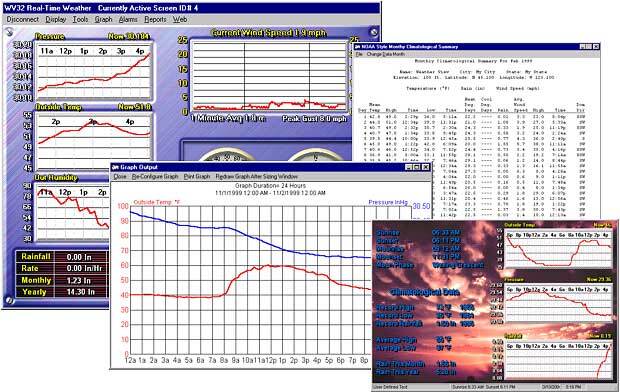 The Weather View 32 program will show current readings, log, and graph your data. You can also upload directly to Wunderground.com, that will log and graph your data on their website that can be seen worldwide. The weather station arrives pre-configured so the user will only have to power on the unit to start transmitting data. Try our state-of- the art equipment – the technology and costs will continually beat our competitors. Data rates up to every 15 seconds are available. Externally Powered Controller – Modem programmed to Verizon or Sprint cellular data to best signal strength, integrated mast mounted enclosure. 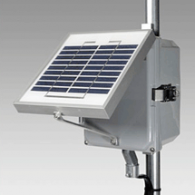 Inputs include wind, temperature, humidity, pressure, rain, solar radiation and lightning. Other inputs include system voltage, two optional temperature sensors inputs. 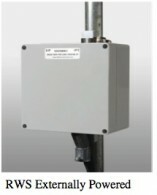 Specs: 12VDC via wall transformer, Dimensions: 6”x6”x4”. Solar Powered Controller– Solar Panel 10 Watt, 12 Volt, 15AH SLA Battery x2, Run time is 15 days with- out direct sunlight, needed is 2 hours daily of direct sunlight to maintain battery charge. Enclosure Dimen- sions 10x8x6, Fiber Glass Reinforced Plastic. Wind- Model TW-WS – Speed – Accuracy 5%, Resolution 0.1 mph (0.1 m/s) Range 0-199 mph, sample in- terval 1/sec. Direction -Accuracy 5%, Resolution 22.5°, sample interval 1/sec. In NWS-Solar Model TW- WSA Speed Accuracy 5%, Resolution 0.1 Range 0-199 mph, sample interval 1/sec. Direction 360° Accuracy 2°, Resolution 1°, dead band 12°. Data– Incoming data can be sent to Wunderground.com, FTP to any web server, or FTP to TWI website with personal folder. The custom folder allows TWI to set alarming service to your specified parameters. User can be notified by email or text if parameter set has been exceeded. NORMAL DISPLAY - Displays wind direction and speed; date and time, inside, outside, and aux temperatures, barometric pressure, humidity, daily, monthly, and term cumulative rainfall, (solar radiation in WR-25-S) and lunar tide cycle. MIN/MAX READINGS - Displays minimum and maximum (since the last clear) wind speed and direction, temperature, barometric pressure, relative humidity, rainfall rate, (solar radiation in WR-25-S) and the date and time of its respective occurrence. SELECTABLE SCALE - English or Metric. WINDCHILL INDEX - Indicates Windchill factor. COMFORT INDEX - Displays temperature humidity index. LAST RAIN - Shows date and time of last rain and rate. CUMULATIVE RAINFALL - Registers rainfall over daily, monthly, and user defined time periods. WIND AVERAGE - Displays the average speed and direction for previous minute. RISE/FALL - Indicates rising or falling trend in temperature (solar radiation in WR-25-S), pressure, and humidity. HOLD - Deactivates information cycling of respective display. SELECT - Puts weather station into various setting functions. LUNAR/TIDE CYCLE - predicts high and low tides. WARRANTY - Limited One Year. RS-232 ADAPTER - A serial port (RS-232 adapter) is built into every unit. This feature allows common serial printers to be plugged directly into the instrument (cable not included). The instrument may be directed to print at intervals chosen by the user. 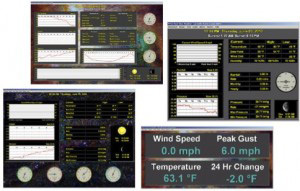 The weather station can also be tied directly into an IBM PC, or Macintosh computer, through its RS-232 adapter or plugged into a modem for remote monitoring. NON-VOLATILE MEMORY - In case of power failure, the clock function, calibration and all data are preserved. your real-time weather screen. Animate any retrieved images with a mouse click. data in near-realtime with moving dials and indicators updated every second. Broadcast version with Slide Show and Transition Effects. Customize the real-time screen?s size and color, or assign a user-defined image as the background. Professional Edition All features enabled. Upload images as often as every five minutes. Use HTML parsing. Download METAR data, forecasts and satellite images from the internet. Email current conditions of any or all sensor?s current conditions hourly. Java Viewer Allows visitors to view your Weather Station in real time on your web site using your data collected by Weather View 32. The JAVA Viewer is also viewable from most web browsers in any operating system. Client A companion product to Weather View 32 Professional. The Client version lets any workstation on a network where Weather View 32 is installed and active to access the archived and current weather data in real-time.